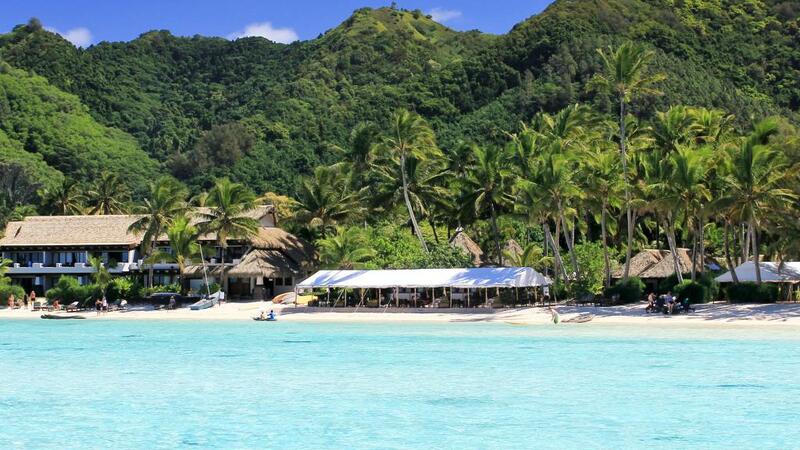 After extensive research I decided to stay at the Pacific Island Resort for our family holiday in Rarotonga, Cook Islands and I was not disappointed. I searched prices online for several days before booking through TravelOnline services which offered the best deal including transfers and daily vouchers. Our flight arrived from LAX at 6 AM and we were immediately given a warm welcome, room and breakfast after transfer from the airport. This was all highly welcomed after the 9 hour flight! The Premium Family Room was perfect for our family of four. The location near the pool was excellent for rinse off and cool down after our short walk back from the beach. Kids Club had very fun daily activities and adventures for our kids. They loved kayaking to the islands and finding hermit crabs, husking coconuts, playing games, paddle boarding, dancing and craft making. Kids Club Staff was wonderful. I agree with earlier food/drink reviews. Food is good, the setting is beautiful but everything is expensive. In all fairness this seems to be the norm for the whole island though. The Night Market is a two-minute walk and is a great option. There are also several convenience stores for ATM, snacks and drinks which are only a couple minutes walk. The whole staff at Pacific Resort, from housekeeping to front desk to Kids Club to Food and Beverage are phenomenal! Thank you for given us the best experience of our lives! The only negative thing I can say about this resort is that they after catching Mahi Mahi on a charter fishing boat I could not get the restaurant to cook any of it. They did rent me a barbecue grill to rent, however, so I was able to cook it myself. Lastly, go see the Te Vara Nui show next door. It is a worthy experience. Staff fantastic and friendly. Accommodation OK. Lovely grounds. Travellers should be aware there is no air conditioning in restaurants or cafes only in your own accommodation room. Need to hire a car to see the Island. Glad we took the holiday to see the Island for ourselves. Everything just went to plan, we had an awesome time staying at the resort and in Rarotonga. No complaints! The location of this resort is fantastic - the best part of the island for sure! The resort is in a \"Polynesian\" style and much more in keeping with the feel of Rarotonga than some of the other resorts. Our beachfront room had amazing views - and was neat and clean - however, it could do with a facelift in the bathroom. The beachfront restaurant and bar was in an awesome position - again, one of the best on the island. Some of the staff were fantastic - a big thank you to Todd and Billie! But I would have loved to have seen some more of that Polynesian personality and hospitality in the management team - they were a little too serious and it didn't seem too organised! Highly recommend the Raro Safari Tour - great day out - and go and get a Cook Islands drivers licence - they are funny!